Ma. Y’er lucky that’s all I done. (She crosses a step L toward boys) Which of you galoots done left your durty boots on my kitchen table? Clematis. Ya ought to be ashamed of yourselves. Ma jist wiped it off - last winter..
Claude. (He is wearing his boots, but looks down to make sure) Weren’t me, Ma. Cletus. (He is wearing his boots, but looks down to make sure) I’m wearing mine, Ma. Clem. (In bare feet, and looking down to where his boots should be) Weren’t me, neither. Clematis. They ain’t mine, Ma. Claude. ‘ ain’t got a notion. Cletus. ‘ suppose they belong to the Parson? Clem. (He crossed to table CS, and picks up boots on table and examines them) Sheriff’s got a pair somethin’ like ‘em. Ma. Clam, where yer boots at? Clem. (Still bare footed, he points to his feet) I’m wearing ‘em, Ma. Ma. Where you wearing ‘em, son? Clem. (Clem crosses R a step or two Toward Ma, as Claude counters C) Why that’s the dumbest question I ever heared. I’m wearing them right here on my feet. (He looks down) ‘ least I was. (A pause) Ma, ‘ think someone done stole my boots. Clematis. Did ya check yer pockets, Clam? Ma. Why don’t you call on Sheriff Jack Hare? Maybe he can find ‘em for you. Claude. (He takes a step DC) I don’t think we ought to do that, Ma. Ma. Why not? Sheriffs is supposed to find things. Cletus. (He takes a step DLC ) ‘cause Clod , Clam and me was planning to rob the bank. Clem. If Sheriff Hare heared about it, he might get upset. ‘ might jist shoot one of us. Clematis. (A step R to call attention to herself) Not if’n one of you’ns shoot him first. Cletus. (He takes another step DLC to L end of table) Forgit the sheriff. Us four boys ’ll find Clam’s boots in no time. Claude. (He takes a step DC to C of table) Yeah, Ma. Me, Cletus and Clod sure will. Ma. (She crosses L to Claude, as Clem counters R) Ain’t yer name Clod, son? Claude. I meant me, Cletus, Clam and me. Why the four of us can ferret out anything. Clam, you look in the barn. Cletus, you check the hen house. And I’ll go check down by the creek (pronounced “crick”). Parson. (Parson enters and crosses L past Clematis to Ma) Howdy Mrs. Scaggins, ... boys. Clematis. Ma. ‘ afternoon, Parson. What brings you all the way out here to Scraggins Gulch? Parson. Why ma’am, you invited me for dinner. Said you had a problem that needed powerful discussing. Ma. (She crosses R to Parson) That weren’t fer today. Clematis. When were it fer, Ma? Parson. Sure, was. Did ye fergit? Ma. You ain’t invited til next Tuesday. Clematis. (To Ma) Ma, does next Tuesday always come after last Monday? Clem. You’re right, ma! It’s Tuesday all day long. I done checked our sundial this morning. Ma. All right, then. Today is only this Tuesday. You wasn’t invited til next Tuesday.” It won’t be next Tuesday until next Tuesday. Ye got it all wrong, so come back then. Cletus. (Crossing a step to Parson) Ma cain’t cook the chicken today. Clod ain’t stole it yet. Parson. Would ye serve a “man of the cloth” poached chicken? Claude. Don’t see why not. ‘ twas your chicken we was fixing to steal. Clematis. Besides, Ma weren’t planning to poach it. She were gonna roast it. Parson. (He crosses below table to Cletus and grabs him to make a point, taking Cletus DSL) You leave my chicken alone. That thar chicken was given me by the Scrud family. They couldn’t afford to put money in the plate, so they gave me the bird, instead. Ma Scraggins has decided it’s time to marry off her “four” illiterate and worthless sons, Claude, Cletus and Clem (in reality there are only three boys, but nobody at Scraggins’ Gulch is particularly proficient in math). To that end, she requests the assistance of Pastor Hezikiah Cropkiller, the local man of the cloth. Ma’s boys, however, have hatched a plan to rob the Vulture Rock bank. The only problem is that there is no bank in the town of Vulture Rock! 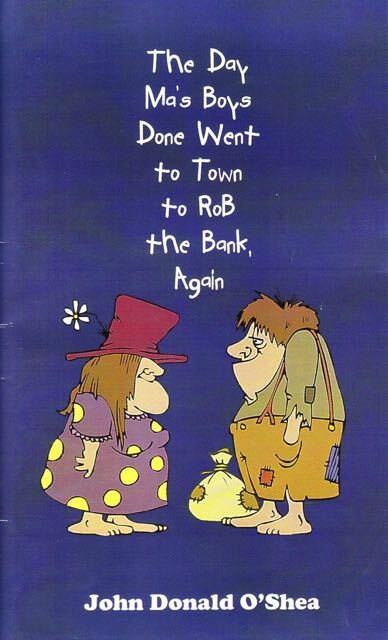 Indeed, the last time Ma’s boys tried to rob the “bank,” they robbed the livery stable, scared the heck out of the horses, and stole all the horse chips because they mistook them for silver dollars. This time, the boys mistake the county jail for the bank and end up stealing three of the town's most beautious "womenfolk" — Belle Golden (saloon owner), Prudence Pleasing (switchboard operator), and Gloria Gobblegook, (the town gossip). They “bag, and kidnap their prospective brides, and bring them home to Ma for her approval.